A content silo is a method of grouping related content together to establish the website’s keyword-based topical areas or themes. Bear with me now. Content silos are important to both SEO and usability. Think back to your last visit to a library – you know before Kindles and iPads existed. How did the library staff help you find books of interest? They grouped content into sections such as fiction or nonfiction. Well guess? That is a content silo, but the old school kind. Barnes and Noble’s website navigation is a great example using content silos. They group their products in a structure of like content. Barnes and Noble is grouping content into subject matters so you can easily find what you are looking for when you visit their website or physical store. While most people would assume the company does this for ease of use for their buyers, they also do this for search engines. If you browse through the website you’ll see this segmentation is done within their website navigation, online store, sitemap, and really throughout the entire website. Note: Barnes and Noble stops content silos at the actual product level and instead uses a more flat URL structure and a very long URL. Why are Content Silos Important to SEO? Content silos not only help real live human visitors, they also help search engines. This is because just like the human visitor, search engines need to have a good understanding of your website’s content. They want to know what it is about, how it is structured, and where it is located. Content silos help with this effort by providing a set of structure to content that mimics that of old school index cards at the library. Another reason content silos have an importance in SEO is that search engines award keyword relevancy (or the level of importance) based on the page’s content as well as the relevance of the entire website. In other words, if I want to rank for the term SEO, it would be much easier for me if I had a section of content in my website about SEO related topics and not just one page. Having topical content helps support the website’s overall authority and thus an individual page’s rank. Just like the navigation of Barnes and Noble, it is much easier for search engines to find and deliver a relevant content when it is focused and organized around topics and well organized. Below are two more content silo examples. 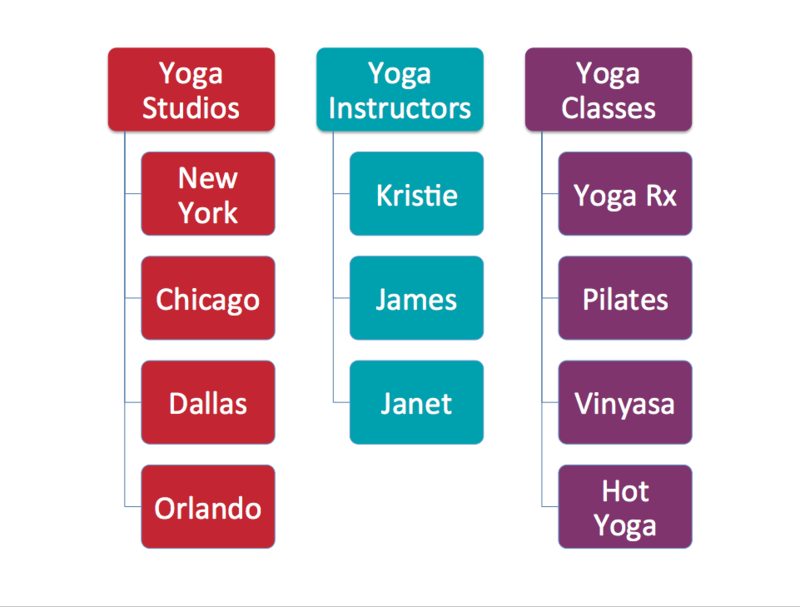 One would be for a yoga studio franchise and the other is for a Las Vegas travel blog. While these two examples have very different subject matter, the concept of group content remains the same. Our above examples would have specific URL structures to support the content silo within the website or blog. These are called parent and child page/post relationships. Before you consider any content silos for your website or blog, you need to do a thorough review of your existing content and future content with both being guided by keyword research. Remember – the data of keyword research will help guide you down a path that will produce tangible results. Creating solid content silos are just one part of the overall SEO process. This would come before writing content, but after keyword research. If you’d like help with creating content silos for your website or blog, we’d love to help. We offer SEO consulting, as well as an opportunity to learn SEO in a self-paced manner. Great post Rebecca – This been around for year and how easily we have wondered off from using this powerful method that’s still very powerful today. There’s nothing better then to please Google as well as your site visitors. What Google wants us to do and great? A good solid user experience and Rebecca just reminded us. Thank you! This is such an important process for on-site SEO. And with user experience, CTR and traffic driving keyword results today, you want content grouped like this for users. Right on point Rebecca. Great and informative article about silos. Since I started using silos my clients websites rank higher in less time. The best is that once you understand the setup, it becomes second nature when you plan a website. Again it proves that their is a difference in value added by companies who design websites and online marketers who design websites. I also use Content Silo to rank most of my pages. It is not easy to create massive related content in different niches but it pays in the longrun.